Sign up for VyprVPN. VyprVPN lets you choose between a variety of VPN protocols and doesn't use third-party servers. Click connect to gain access to a free and open Internet. Visit websites and social media sites, and experience the Internet without restrictions or blocks. What Websites are Frequently Blocked? Numerous websites are blocked in countries around the world as a result of Internet censorship and filtering. Some websites are blocked more frequently than others, such as social media sites like Facebook and Twitter and news websites. Another site that is frequently blocked is Google. 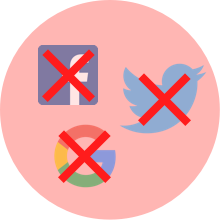 When governments block these popular social platforms and sites, they inhibit the spread of important information and censor citizens. It's crucial to know your rights, defend your Internet freedom and maintain access to the web without restrictions. This is why downloading a VPN is so important; with a VPN users across the globe can access popular websites without being subjected to censorship. Why Are Popular Websites Blocked? Many countries, such as China, Iran and Turkey, block access to popular sites by detecting your IP address location. Governments do this for a multitude of reasons, ranging from stopping the flow of information to suppressing uprisings. Regardless of the reason, censorship is a tactic used to control access to important data and information. 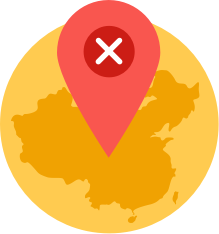 With VyprVPN, geographic restrictions are no longer an issue. A VPN lets you select your server location, allowing you to access a free Internet devoid of government surveillance and local blocks.